California Museum of Photography is exhibiting “The End of Film, a Brief History of Digital Cameras, 1987-2009″ through January 30, 2010. The exhibit includes digital cameras beginning with Casio’s 1987 VS-101 .28 mp, which digitized video signals rather than capturing a still image. It holds the esteemed label of being the first digital camera used by fine art photographers. 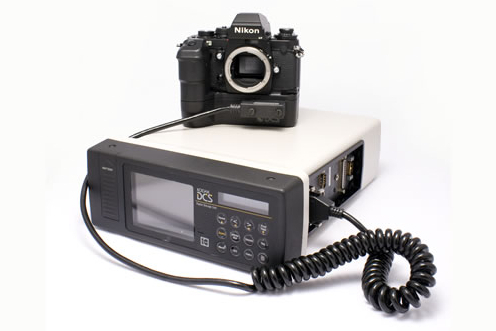 The first truly still image camera on display is Kodak’s DCS-100 from 1991. It boasted 1.3 mp, weighed 20 pounds, and cost a mere $13,000.00. Fast forward to 2009. Multi media is calling, and the exhibit ends with the Canon 5D Mark II. This camera is capable of capturing stills with 21 mp and can take 1920×1080 HD video for up to 45 minutes. I am in awe of the newest versions of digital cameras, but walking through this show only makes me wonder how obsolete they will be in another decade. I hope CMP has a second exhibit of the history of digital cameras in 2019 so we can be wistfully nostalgic once again.